The retail sector employs almost 16 million workers in many different types of positions. The pay isn’t always great, and you’ll need a flexible schedule for many jobs working in retail. However, not all roles require formal education, and there are opportunities to grow with a company and move up the career ladder. What’s the best job for one person may not be the right fit for someone else. It depends on your skills and interests, and what you want to get out of work. For example, cashier positions are often low paying, but you may be able to work a flexible schedule around school or other responsibilities. Retail sales associates can earn more, especially when there is an opportunity to get paid commission, but you need strong interpersonal skills and the ability to close a sale. Because of the large number of employees in the field, and the scope the retail industry covers, there are plenty of opportunities for career advancement. Once you’ve moved up from an entry-level job, there are opportunities for decent paying department, store, and district management positions, especially with the larger national chains. You’ll also likely find IT, security, and administrative positions at the big corporations. For college graduates interested in making retail a career, many leading retailers have management training programs and actively recruit students and recent graduates. You’ll find the details in the career section of the company’s website. Here’s an overview of some of the top retail jobs, including what the job entails, the qualifications needed to get hired, and the median earnings. Buyers and purchasing agents (median annual salary) buy the products sold in retail stores. They are responsible for evaluating vendors, negotiating prices, ordering, and arranging delivery schedules. One of the perks is getting to attend trade shows to check out what’s new. At large retailers, buyers work out of corporate headquarters. Smaller organizations may have an in-house buyer. This isn’t the best paying retail job (median hourly pay), but it’s one where there are no formal educational requirements for new hires. You can apply online at most major retailers, and on the job training is provided. Opportunities are available at department stores, grocery stores, gas stations, and other retail establishments. Positions are plentiful, with 2.8 million people employed as cashiers in 2015. Many positions are part-time, though some employers offer benefits. There are many different customer service roles (median hourly salary) in retail. The job could be working at the customer service desk handling returns and payments, providing product information and pricing to customers, or responding to inquiries about availability and delivery. Demonstrators and product promoters (median hourly pay) share information on new products, and products which are being promoted. Depending on where you work, you could be giving away food or beverage samples, suggesting makeup options to customers, sharing information on products in the store, or otherwise getting customers to notice the product you’re pitching. A department manager (median hourly pay) is responsible for one section of a retail store. For example, grocery stores have managers for produce, frozen food, meat and seafood, and dairy. This job could be a promotion from a stock or associate job, or the employer could recruit candidates with experience in that department. District Managers (median annual salary) handle a group of stores, usually within a geographic territory. They supervise operations and manage the stores within their region. Retail IT Coordinators (median annual salary) provide operations and user support for retailers. Responsibilities may include hardware, software, mobile, messaging, and server support. IT coordinators troubleshoot and resolve issues, and upgrade and maintain store systems. Human Resources Managers (median annual salary) are responsible for recruiting, hiring, training, and employee relations. Depending on the retailer, this role could be either a store or corporate position. Retail Logistics Coordinators (median annual salary) get the products to the store. They keep track of inventory, order stock, allocate merchandise to stores, manage the organization of stock rooms, and ensure timely shipping and delivery to maintain stocked shelves and racks. Loss Prevention Associates (median hourly pay) are hired to prevent shoplifting. Employees are required to follow the organization’s loss control policies and cash handling procedures. Responsibilities may include greeting customers, checking bags and tags, and inspecting store alarms and locks. Many retailers have management training programs (median annual salary). Some are designed for college graduates to rotate through different areas of the retail business as an introduction to starting a career with the company. Others are focused on training employees who are being promoted from within. Retail Marketing Coordinator (median annual salary) job responsibilities will vary significantly based on your employer. If you’re working for a small retailer, you may handle everything from print advertising to social media engagement. At a large employer, your role may be more specific. This is a retail job that pays well and lets you skip being on the sales floor. Online Merchandisers (median annual salary) are responsible for digital merchandising of the products on the company website. The ability to measure customer interest, determine sales strategy, decide on product promotion, and analyze data are all requirements. Stylists (median hourly pay) help optical clients choose frames, suggest clothes to customers, manage fitting rooms, and drive sales. These positions are available in eyewear stores, high-end department stores, and specialty clothing and accessory stores. Order Processors (median hourly pay) work for retailers that sell big-ticket items like cars, furniture, and appliances. They receive and process orders, track orders, handle customer and vendor inquiries, and coordinate shipments and deliveries. Pharmacy Technicians (Median Hourly Pay) work in drug stores and pharmacies within large retail stores. They receive and process prescriptions. The job involves data entry, printing labels, stocking shelves, and preparing and packaging medications. Strong customer service skills are important for this role. Retail Merchandisers (median hourly pay) set up and maintain displays, including featured and seasonal products. Some merchandisers work for the store, while others work for the product manufacturer. Sales is a high employment occupation (median hourly pay), with 4.3 million retail salespersons employed in the U.S. in 2015, and 7 percent expected growth between 2014 and 2024. It isn’t a high paying job when you look at the average hourly rate, but there may be an opportunity to earn commission. That can add up when you’re selling high ticket items like furniture, appliances, or automobiles. The Store Manager (median annual salary) is responsible for the day-to-day operations of the store including inventory, customer service, productivity, promotions, and profitability. The role may include hiring, scheduling, training, and managing employees. A retail Assistant Manager (median hourly rate) helps the store manager with day-to-day operations. 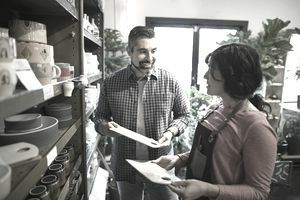 Depending on the size of the store, job responsibilities may include oversight of a specific area of the store or assisting with general management.